South Korean cinema has gotten a lot of international attention in the last fifteen years, but it's mostly for the tough, realistically grounded, often brutal and harrowing films like Park Chan-wook's Vengeance Trilogy (Sympathy for Mr. Vengeance (2002); Oldboy (2003); Sympathy for Lady Vengeance (2005)), Kim Jee-woon's I Saw The Devil (2010), Bong Joon-ho's Mother (2009) and Na Hong-jin's The Chaser (2008). But there's a whole other side to Korean film. A silly, weird and often satirical side. 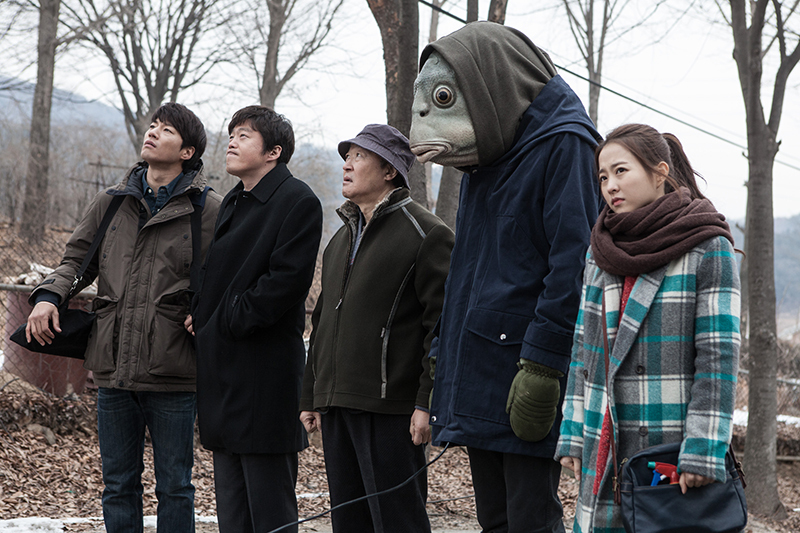 You might've got a glimpse of it with Bong Joon-ho's The Host, which played TIFF's Midnight Madness program in 2006. In The Host, a slippery river monster terrorizes Seoul and a family unites to rescue a girl carried off by the very disgusting critter. The Host is both affecting and hilarious. And the action's pretty sweet, too. It's billed now as a sci-fi horror comedy, but I remember at the TIFF Midnight Madness premiere Jang told the crowd that it hadn't done well in Korea because it had been billed as a "romance." The weird thing, is I can kinda see it. Speaking of eccentric romance, Park Chan-wook moves away from vengeance and towards, weird but sweet love in, I'm A Cyborg, But That's Okay (2006). Young-goon (Im Soo-jung) who works in an electronics factory and believes she is a cyborg tries to fix herself by slitting her wrists and inserting the proper wiring. She wakes up in a hospital. And there she finds love when a soul-stealing man in a rabbit mask steals her heart. That man is also Korean superstar, Rain. But... it goes kinda dark for other people. Did you know that there is a whole Google search category, "Rain Abs." There is. He's not allowed to have shoelaces in the hospital, but his abs are the real danger. Kim Jee-woon has made a lot of neat, eccentric films. His The Good The Bad The Weird (2008) is much lighter than, say, I Saw The Devil. It also premiered at TIFF, but it played the Elgin Theater as a Gala. It's a post-modern Western set in 1930s Manchuria as three gunfighters try to find the map to buried treasure. It also has an amazing chase scene. So good. You should watch it. Jung Woo-sung can really ride and Song Kang-ho in a motorcyle with a sidecar. And the action was explicitly inspired by Sam Raimi's Spider-Man films. And one of Kim's earlier films, The Foul King (2000) is very fun. Plus, it's another film that played Midnight Madness. Dae-ho (Song Kang-ho) takes up professional wrestling in part to get his boss to stop harassing him. Fight, Ultra Tiger Mask! Kim's first film, The Quiet Family (1998), inspired Takashi Miike's The Happiness of the Katakuris. In Kim's film a family running a small hiking lodge tries to deal with a series of more or less accidental deaths. In Kim Tae-gyn's Volcano High (2001) the favorite, and possibly only subject, is asskicking. When teachers crack down, students rebel and every punch is explosive. Everyone is a master of martial arts. And everyone is a master of amazing hair. (And, yep, another Midnight Madness entrant. I saw it at 9am and it kept me awake). But we know what you're wondering. You're wondering about Vampire Prosecutor. Will it ever be a feature film? I don't know. But I have heard there is a follow-up series in development, Vampire Private Investigator. Who knows? 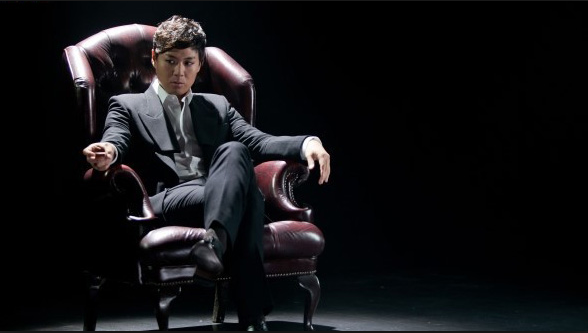 Vampire Prosecutor ponders the future of Korean cinema.